Went shopping the other day, and while waiting for my friend, I wandered off to check out whats new for fall at Holts. 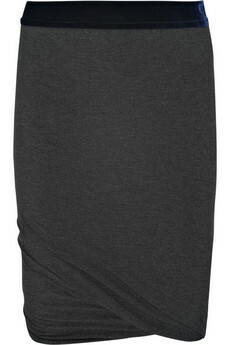 Since I still have 10 lbs to go before I reach my pre-preg weight, I refuse to buy anything that would only fit now...until I saw this: Alexander Wang modal spandex ruched skirt. It was love at first sight: the strechy t-shirt material, the ruching AND the elastic waistband! Actually, I was sold at the ELASTIC WAISTBAND. Perfection, including the price: $110 CAD!! Can't wait to wear it!